Your card is grrrrreat! When I first saw this set and the bear this is exactly how I pictured doing a card – with the bears having their arms around eachother. THanks for sharing – this is sooo fun! Mary Jo, this is just adorable! LOVE those bears! LOL — what adorable bears, Mary Jo!! Wonderful coloring, fabulous paper & ribbon! Enjoy your long weekend! I love it! What an awesome idea to add the three bear friends!! This is adorable. I can not wait to get my set! Thanks for sharing your ideas. Oh My Gosh! So stinkin’ cute! Adorable card and I’m with you…not a camper! What a great idea with this set!! I love the bears with their arms on each other’s shoulders!!! It made me laugh out loud! Oh my goodness. Your coloring is amazing! The card is soooo adorable! You rock! OMG!!! Mary Jo, this is hilarious!!! I giggle every time I see this set…but this is just over the top amazing!!!! I absolutely love it!! Oh my heavens i LOVE LOVE LOVE your party bears!!! I was also drawn to this set, but didn’t get it because I couldn’t see what I would use for it (I don’t camp either)….but now I see the possibilities! this is adorable. 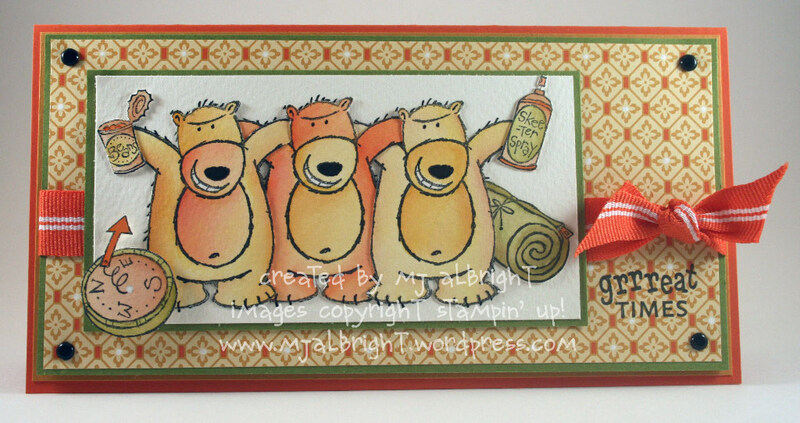 I love how you stamped the bears all together. They do look they are ready to party. love the dsp-it’s one of my new faves! This card is so darn cute, I had to leave a comment on your blog too!! I mean it, there has been alot of amazing cards lately but this one rocks!!! Great job! Sorry, but I have to case it, but who wouldn’t want to!!! Oh my gosh, they’re hugging! That card is so great – love how you used the new set! Very cute! Great way to use the precious bears! Wow your bears look great…fab colouring. OMG – that is totally cute!!! I just love this set – got mine today, whoohoo!! Time to play!! Your take on Beate’s sketch is really adorable! Off to do mine! I love these guys, I can not wait to get them, they are to arrive soon. Your card is just adorable. What a hoot. Brilliant. This card is so stinkin’ cute!!!! Love it! Dang, MJ – you’re rockin’ this stamp set. You always do such gorgeous work, my friend! Love your story, too! Hey I love what you did with the Bears. I am a camper; we do lots of camping with the scouts and I think i would flip out if I saw a bear! or snake for that fact. We did hear a bobcat in our camp one time early am. Did you mask the bears or cut them and place them? You did a fine job and I loved this set from the moment i saw it. I have tried to get the set Scouts at play off ebay and have never been successful since the price is always way up there. So this set will have to do. Nice to see you working on some whimsy stuff! So Cute cute cute! Cute, cute, CUTE!!!!! I love this card!!! I love how the bears are hugging each other. The colors are fantastic!!!! OMG!! This is too CUTE!! I *had* to have this set and I love it!! TFS! now this is cute – almost makes me like this set!! i would’ve never thought to make a whole crew of bears – but it’s a great idea and very cute! !